The 2018 NANFA Convention is being co-hosted by Dr. Johnathon Davis and Michael Wolfe on the campus of Young Harris College on June 7-10. Young Harris College is a private, liberal arts institution in the beautiful mountains of Northeast Georgia. The campus is located just two hours from Atlanta, Asheville, Chattanooga and Greenville. All of our convention events (registration, presentations, banquet, etc.) will take place on campus. Click Here for a map. Registration on Thursday afternoon (noon - 5:00 pm) will take place in the lobby of the Rollins Campus Center (#4 on map). We will have access to the William Hatcher Dining Room (also in the Rollins Campus Center building) that evening for meeting and greeting and registration for Friday's field trips. The Hatcher Dining Room will also serve as our meeting room for the presentations. The banqet and auction will be in an adjacent larger room. Young Harris will not only be the venue for the 2018 NANFA Convention but will also provide us with our lodging and other accommodations. We will all be able to spend time together and will have pretty much everything we need right there on campus. - We have made a commitment to the college for a minimum number of room nights so we encourage all of you to stay with us on campus. - Rooms will be charged $45 per person per night. - Each person will have their own sleeping room. - Groups of four sleeping rooms will share a den and kitchen space and 2 bathrooms, essentially creating a small 4 bedroom/2 bathroom apartment living space. - NANFA is coordinating the accomodations so you can indicate on your registration if there are persons that you want to have in your same "apartment". This is an excellent opportunity for us to stay together at a reasonable price and excellent accomodations, and we are encouraging everyone to stay in the provided rooms. Since these are dorm rooms, there are some extra things that you will need to bring, and some things that you should not bring. Click here and please make sure to read this list before you pack. 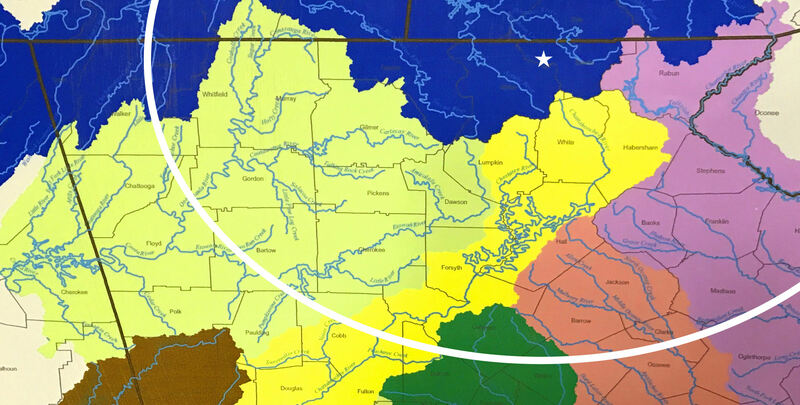 This location will give us access to 6 major watersheds with a 2 hour drive (Tennessee, Coosa, Chattahoochee, Ocmulgee, Oconee, and Savannah) so there will be lots to see whether you are coming to Georgia with your seine or snorkel or rod and reel. Anyone that wants to do any collecting (with nets or rod and reel) will need to have a Georgia Fishing License. If you are planning to collect or angle, you will need to follow all fishing regulations. This includes observance of Georgia's Trout Waters which are most of the northern part of the state. For anglers, this means that you should add a trout stamp to your fishing license if you plan on angling (even microfishing) anywhere in trout waters. For seining, this means that you will need to be outside of the trout waters to do any collecting (although we will be able to seine with our GADNR hosts, we will not be able to keep anything collected in trout waters). Click here for a letter from our Georgia DNR NonGame Conservation Section on collecting fishes in the state of Georgia..
You can get 1 day non-resident fishing license and can extend them additional days. June 7 (Thursday) Travel day and check-in (registration desk will be open noon - 5:00 pm). You should plan to arrive early if at all possible. Johnathon and Camm Swift are planning a special session in the Biology Lab (3:00 - 5:00 pm and 6:00 - 8:00 pm with a break for dinner). Click here for details on this session involving specimen identification and preservation. We will also have a Hospitality Room available for meeting and greeting and fishy talk of all sorts. June 8 (Friday) Morning field trips will be lead by local NANFAns and Georgia DNR representatives. Box Lunches provided. June 9 (Saturday) Convention meeting and presentations all day Click Here to see the full slate of presenters that we have lined up. Evening banquet (with key note speaker Brett Albanese from Georgia DNR Non-game Division) followed by the NANFA auction fundraiser. June 10 (Sunday) Field Trip options to be determined based on participating and various travel plans. Box lunches provided. Fishes of Georgia has a complete listing (with location maps) of all the fishes you might find in our state. A Field Guide to Fishes of the Conasauga River can be downloaded for free here.